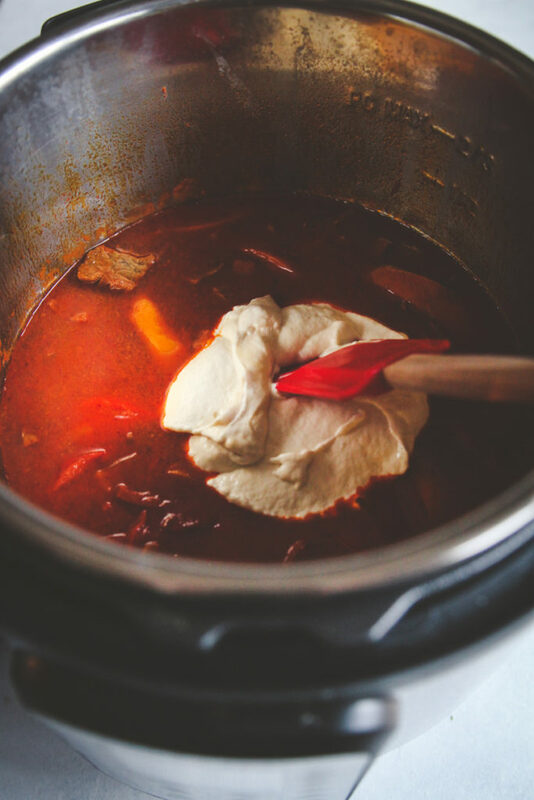 This Instant Pot Hungarian Goulash gives me all of the warm and fuzzy feels. It reminds me so much of my Mom and my childhood. Growing up, my Mom used to make goulash all the time on weekends. I can still so distinctively remember the smells throughout our whole house, so anytime I make it now, it makes me smile. 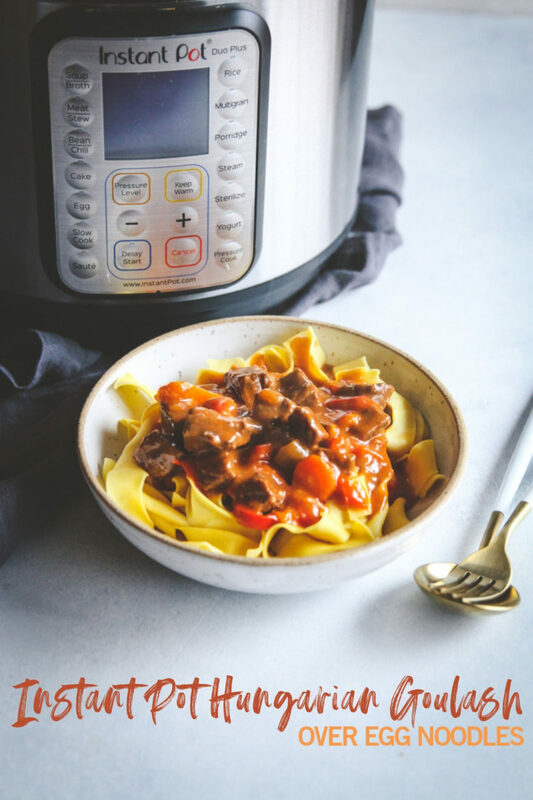 When you make this meal in an Instant Pot (pressure cooker), it’s done in a flash and is a delicious comforting hearty meal. My Mom is German/Austrian/Hungarian, so these flavors are right up her alley. 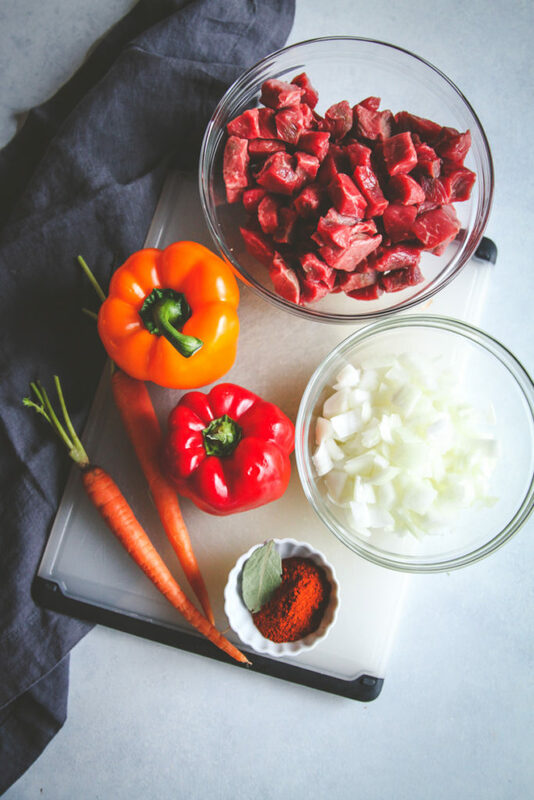 The beef goulash is made with a tomato based sauce and seasoned with sweet paprika (also known as Hungarian Paprika). 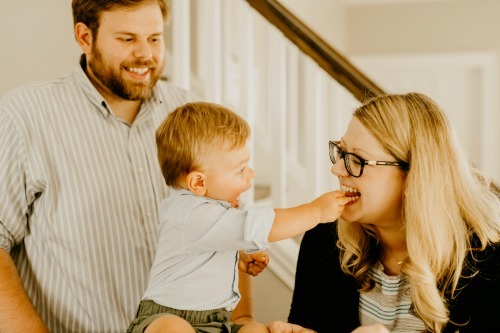 This is such a family favorite recipe! 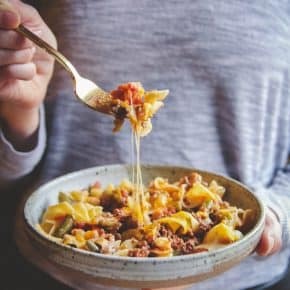 This cheesy beef noodle casserole is another one that’s such a family friendly comforting meal. If there is one dish my Mom could make, it was this goulash. 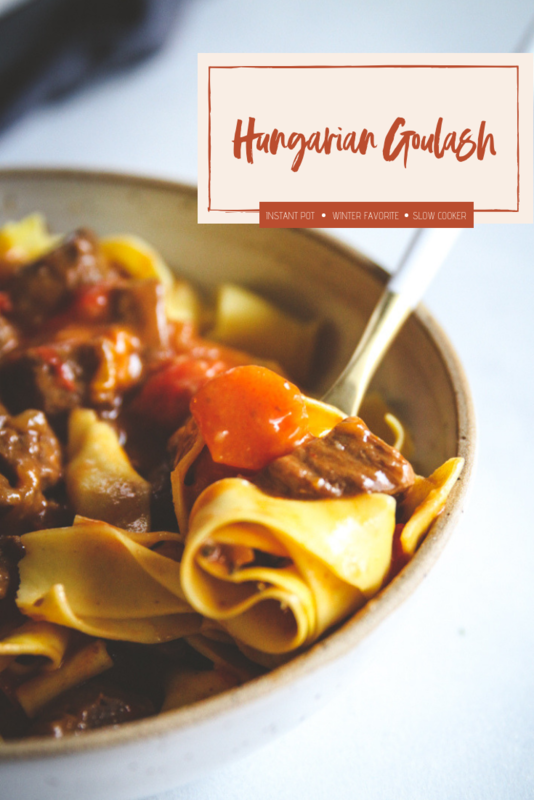 She would start this Hungarian goulash recipe early in the morning and that would be our Sunday night dinner. 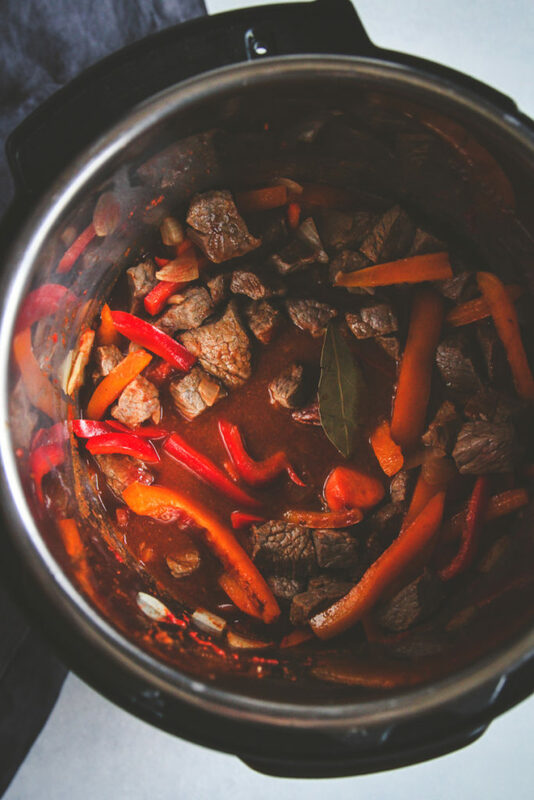 Nowadays, I use an Instant Pot to speed the process up! I bet my Mom would have loved this when we were kids. If you’d prefer to go old school, you can of course, use a slow cooker and cook it for 8 hours on low before adding the gravy. 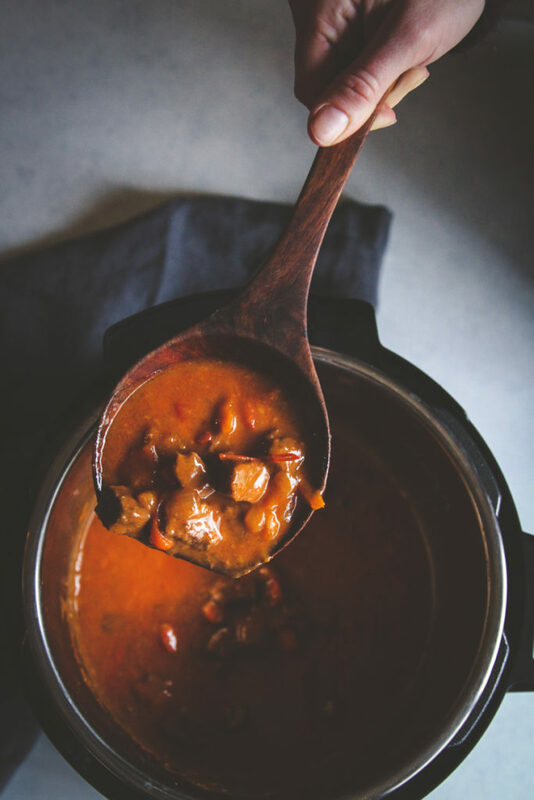 Goulash is a hearty, comforting beef vegetable stew (well kind of a stew). There are many ways you could eat it, but I always had it over egg noodles as a kid, that is how I prefer it to this day. I was so excited for Nick to try this recipe because he has never had it. The verdict is…..he loved it! BUT, not at first. Little did I know, he was being funny and pretending not to love it at first, but later admitted that it was SO good. It’s just so comforting and tastes like home. And it was such an important part of my childhood that it was extra special to me that Nick loved it too. Nick’s Mom has a dish that has the same type of memories tied to it. She makes a chicken broccoli casserole (I shared the recipe 5 years ago so please excuse the photos) that is Nick’s childhood in a pan! It’s basically chicken, mayo and chicken soup with some croutons, broccoli and cheese. It is warm and comforting and a casserole Nick loves. With an Instant Pot, it’s super easy to whip this dish up. First things first, saute onions then add in the bell peppers, carrots and beef. Then let these items brown up a bit and add in the broth. Close the lid and forget about it for a bit! When it’s done cooking you’ll stir a ‘slurry’ in that makes the broth nice and thick and creamy. As it sits, it will thicken up and be served over egg noodles or rice. 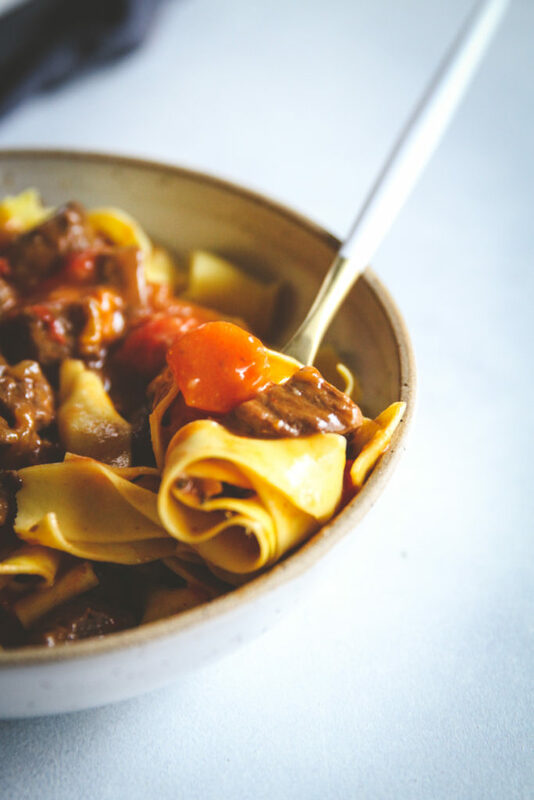 Make this Instant Pot Hungarian goulash over egg noodles when you’re wanting a delicious and comforting meal! Hit sauté on your Instant Pot. It automatically defaults to 5 minutes, which is perfect for this recipe. Add onions and oil. Sauté for 5 minutes. Add meat and sauté for another 5 minutes. Add in salt and pepper. Add in carrots and bell pepper, paprika and tomato paste. Stir together. Add in beef broth and stir. Liquid will almost cover the meat, but not fully. While that is cooking, make egg noodles according to package (or rice if you prefer). Now it's time to make the rue/sauce. We call this sauce, "slurry." For the sauce/slurry, simply place all of the ingredients in a bowl and whisk until combined. 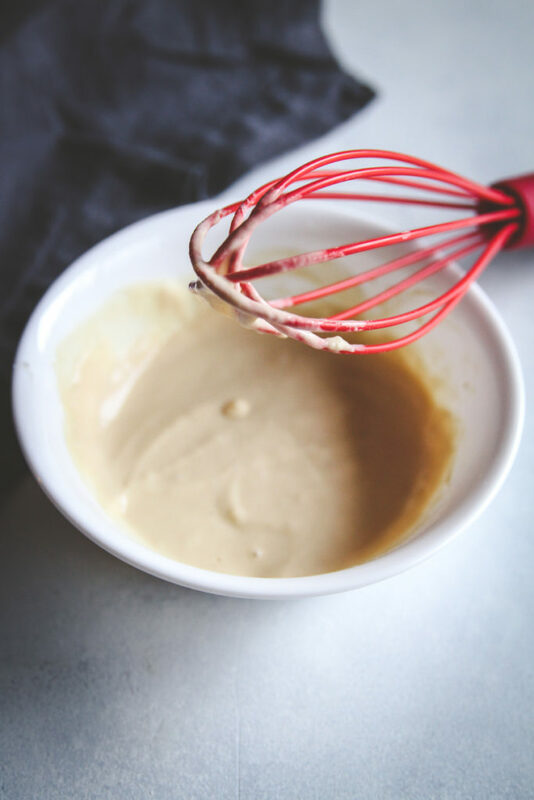 The sauce will be a thick, creamy mixture (almost like the consistency of mayonnaise). This sauce will be added at the end. When the timer on the Instant Pot turns off, turn it from "sealing" to "venting." This will release the steam. Let steam naturally release for 5 minutes. This simply means to just let it set and rest. In a large skillet over high heat cook onion and olive oil for a few minutes (3 minutes) and add the beef and salt and pepper and cook for an additional 3 minutes, to brown the meat slightly. Put onions/meat into a slow cooker and add carrots, red peppers, paprika and tomato paste. Stir together. Add in the beef broth and stir. Liquid will almost cover the meat, but not fully. Add in the bay leaves. Cook on high for 4 hours or on low for 8 hours (I prefer low setting with this recipe). Before serving combine "slurry" ingredients: flour, beef broth and sour cream in a small bowl, whisking together. Stir the slurry into the stew before serving (the stew thickens as it sits, it's really good the next day too). Remove bay leaves before serving. 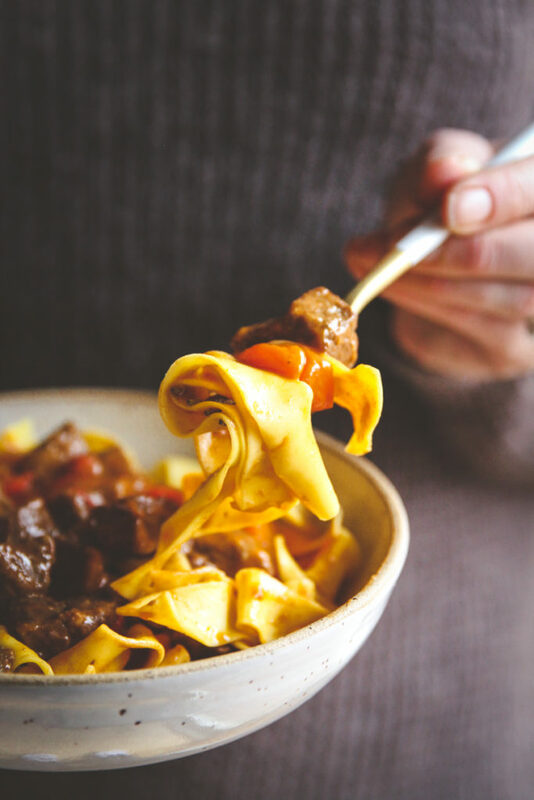 Serve Hungarian goulash over egg noodles (or rice). I can’t wait to try this. My mother in law used to make delicious Hungarian Goulash and now that she is gone, I miss having it. This looks like a good recipe. Thanks for the instant pot version. I use mine all the time!